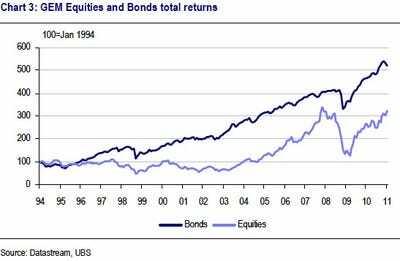 A report by UBS’s Nicholas Smithie says investors are worrying too much about a bubble in emerging equities. If there is a bubble, it is in bonds, which have dominated equities for 17 years. Basically EM bond yields can’t fall much further. Meanwhile EM equities remain at a relatively low 11.4 PE ratio. We believe the equity risk premium to be declining while growth and return on equity improve, bolstering our argument for a re-rating of GEM equities. Bond yields would have to increase by about 100 – 150 bps, with no improvement in growth or profitability, before GEM equities would appear overvalued at current multiples. We consider the risk of rising bond yields, in the absence of higher growth or a lower equity risk premium, to be unlikely. Smithie is particularly bullish on BRIC equities. So who should you bet on: INDIA OR CHINA?